Some people think “PODCAST” is a silly word*. Others think it’s meaningless. It CAN be confusing. Communication is difficult to do well if all parties do not have the same understanding of the most fundamental terms used. Definitions are useful. A podcaster is a person who creates “content” for distribution via RSS feed, a formatted list used by software to play audio and video media. While it may be a singular activity, multiple people could be involved. This might be an unstructured conversation recorded from several locations or in the same room, or a fully-produced “play” with actors following a script and, perhaps, musical performance. A podcast is a captured audio or video recording, perhaps a file in .mp3 or .mp4 format, which contains the content. 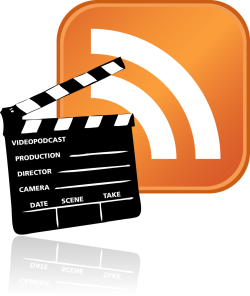 To podcast is the act of creating that audio or video file and making it available via RSS feed. A podcast is a show, audio or video content offered under a specific title and following some theme or format. There are a few hundred thousand of these. Podcasters may produce multiple shows… different content under different titles. Just as these “roll up” to the podcaster/creator, some shows are produced independently yet represented under a network umbrella or as an aggregated group. A podcast may be a one-time event. If the program is a series, though, a podcast is any one specific installment of that series. Counting every episode of every show, there are a few million of these. The reason fans watch or listen is to indulge in the content, sometimes referred to as “pod”. Podcasters, go forth and make good pod. While a podcaster is recording live, speaking into the microphone or camera, often with other podcasters, local or remote, they are podcasting. Podcasters around the world operate in an unorganized, independent arena that is currently forming into a full-fledged industry. Vendors are targeting the business, developers are creating specific solutions to expand audience, and advertisers are lusting over it. As podcasting matures into an industry, what EXISTING industries will it be most like… and which ones will it change? There is a natural pressure for podcasting to fall into the same ruts as the radio and television industries. From formats to topics, it’s much easier to follow than to innovate. Having fewer creative limitations, podcasts will increasingly compete for audience head-on with regular TV and radio programs. I think TV may be more affected than most predict. Some podcasts focus on “local” events while others follow current topics, both can be viewed as a form of citizen reporting. Unlike reporters who have their views filtered through editing or are barred from being heard at all due to the inability to afford printing presses or radio transmitters, podcasters face no such obstacles. I think we’ll see even more local content being generated and, while most will be consumed locally, I think a surprising amount may be consumed outside the local geography by those who are simply interested even though they don’t live there. I believe podcasts are the single most UNDERUTILIZED tool available to education… and the price is right. There is a VAST ocean of knowledge on a broad range of topics, mostly free, often directly from the very person originating worthy thoughts. And the “lessons” can be repeated by the student… over and over… anytime they want… until absorbed. Most who strive for self-improvement have already discovered the great value proposition of podcasts. Soon, people will discover there are some EXCELLENT podcasts available outside the realm of movies and Netflix. They’ll also figure out the amount of podcast content available to choose from is MASSIVE. As podcasters become more proficient at production, some will become indie television show and movie makers while others will lead the way to re-energizing audio-based drama (like the very early days of radio). This will be a most interesting area to watch… either old ad habits will ROLL OVER the podcasting space OR podcasting leads the way to a better approach to advertising. One that is effective for advertisers, acceptable to consumers, and congruent with the content. I have my fingers crossed. *Over the years, some have argued “podcast” is not a good term and should be replaced, while others find no problem with it. The last article was about host-read ads. Thank you for your time and consideration of my views on podcasting. Also, if you are interested in my web media development project, let’s talk!